Smart manufacturing and the innovative strength of Taiwan in plastics and shoe-making machinery were in focus at the 16th Taipei Plastics and Rubber Industry Show (TaipeiPLAS 2018), hosted in Taipei last month. As many as 533 exhibitors from Taiwan and 20 other countries took part in the biennial show, organised by the Taiwan External Trade Development Council (Taitra) and Taiwan Association of Machinery Industry (Tami). 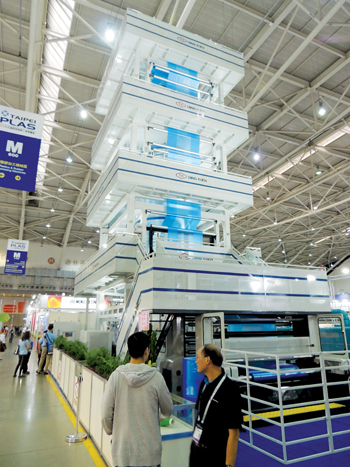 The five-day expo, running from August 15 to 19, covered the plastic and rubber processing machinery, injection moulding machinery, blow moulding machinery, extruders, printing machinery, auxiliary equipment, moulds and dyes, parts and accessories, raw materials, semi-finished and finished products for the plastics sector. The first Taipei International Shoe Making Technology Show (ShoeTech Taipei 2018) was held alongside TaipeiPLAS simultaneously at the Taipei Nangang Exhibition Center. Opening the event, Taiwan’s Vice-President Dr Chien-Jen Chen promised government help to the sector and underlined the importance of machinery industry and the sector’s exports for the country’s economy. The opening ceremony was also participated by Jia-Chyuan Su, President, Legislative Yuan, Taiwan; James C F Huang, chairman of Taitra; Alex B S Ko, chairman of Tami; Wen-Sheng (Vincent) Tseng, Deputy Minister, Ministry of Economic Affairs; Jih-Jia Lin, Secretary-General, Legislative Yuan; and other dignitaries. The show was themed around ‘Reducing carbon footprint and providing green products’; ‘Smart manufacturing and machine systems’; and ‘Aesthetic design and upgrading towards Industry 4.0 to enhance product value’. The exhibition is one of the top three plastics and rubber trade shows in Asia and reflects Taiwan’s growing influence in this sector, said James C F Huang, chairman of Taitra. Taiwan is a major exporter of machinery in the world and last year it exported $25.6 billion worth of machinery, up 21 per cent year on year. Taiwan is also an important producer and exporter of plastics and rubber machinery globally. The country produced $1.46 billion worth of such machinery last year and exported $1.16 billion of them, up 12.8 per cent, to be the world’s sixth largest exporter. By export destination, China claimed the top spot in 2017 with an export value of $247 million (21.3 per cent of total exports), up 27 per cent YoY, followed by Vietnam with an export value of $139 million (12 per cent of total exports), up 2.3 per cent YoY; and India with an export value of US$9.17 million (7.9 per cent of total exports), up 44.1 per cent YoY. The top 10 destinations together made up 73 per cent of Taiwan’s plastics and rubber machinery exports. Taiwan’s plastic and rubber machinery industry now has over 400 manufacturers. Top export items from the country are plastic injection moulding machines, extrusion machines, blow moulding machines and key components. Overall exports were up 4.2 per cent year-on-year during the first five months of this year, compared to last year. Alex Ko, chairman of Tami, said the government has put a lot of emphasis on Taiwan’s machinery industry by making Smart machinery part of its Five Plus Two industrial transformation plan. “We, in the industry, appreciate this commitment and are excited about the prospects,” he said. TaipeiPLAS has been a one-stop sourcing platform for top-notch machinery and cutting-edge technology for manufacturing plastics and rubber products. The expo stood out for its choice of innovative products on display. “This is the place for finding total solutions, building business relationships, sharing insights with industry players and more,” said officials. The exhibition hall resembled production lines with most firms displaying their latest innovative machinery on the show floor and providing live demonstrations of their machines’ capabilities to customers. Buyers had the opportunity to witness first-hand what Taiwan’s plastics and rubber machinery industry has to offer, including energy saving innovation, cutting-edge technology and excellent price-performance value. The show also offered attendees the opportunity to network with ideal suppliers; participating in professional seminars and workshops to gain knowledge on the newest market trends and technologies. Advanced technology was on show with companies showcasing Smart injection moulding machines, high-speed all-electric injection moulding machines, horizontal full-electric injection moulding machines, 3D printers, liquid silicone rubber injection moulding machines, full-electric blow moulding machines, linear full electric high-speed stretch blow moulding machines, IM4.0 smart assistants, automatic monitoring/warning systems, etc. 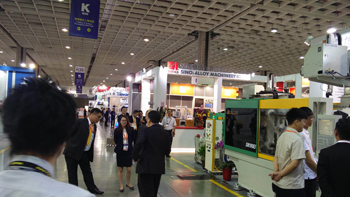 At the show, halls were the latest energy-saving, high precision and intelligent machines and whole-plant equipment. The participating manufacturers offered turn-key solutions to boost production flexibility and efficiency; the latest plastics and rubber machinery and equipment incorporated with automation, data analysis, remote monitoring and IoT technologies; innovative plastics and rubber materials and finished products. The event also had 27 seminars, where researchers and experts from Taiwan and abroad shed light on the latest technologies and product innovations of the industry. The seminars discussed issues related to Industry 4.0, smart diagnostic technologies and smart machinery strategies and practice, sensor application and smart services, cloud platforms, smart machine box programmes, innovative rubber and plastic manufacturing processes, innovative plastic materials. 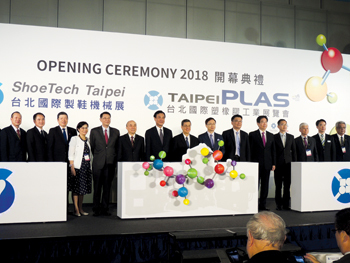 In addition to its well-rounded exhibits, Taipei PLAS was packed with one-on-one procurement meetings, forum, seminars and new product launches during the show. The global plastics and rubber machinery market is tilted toward the mid- and low-end, a market segment where China will have a superior competitive edge. Taiwan will need to move higher-end, where Japan and Italy will be competitors, and embrace the Industry 4.0 initiative, with an emphasis on automation, customisation, and smart machinery, said C C Wang, president of Tami. Larry Wei, convener of Tami Board of Supervisors Industry, said: “Advances in computer technology, information networking, and Smart sensors have brought industrial production into the Industry 4.0 age. Machine tools are part of the trend and other industrial machinery suppliers are also taking active steps to meet the enhanced requirements. “By continuing to innovate and improve, we can increase our competitive edge over global peers and explore business opportunities in major markets,” he said. Fong Kee, Diing Kuen, Multiplas, King Hsing, Plasco, Victor Taichung, FCS, etc. from Taiwan and also world-renowned firms such as Wittamann Battenfeld, Arburg and Engle joining this year to showcase smart machines and smart manufacturing solutions that are incorporated with control system, data analysis, IoT and remote control. • FCS showcased its FA-160 advance toggle hydraulic injection moulding machine. The FA series is a new generation standard servo energy-saving model from the company. Not only are the specifications upgraded, but its design has also been optimised. The machine comes with the electronic control system KEBA for enhanced integration. This has been combined with the IMF4.0 Intelligent ManuFactory solution to develop intelligent injection moulding machines that will extract data and values about the moulding parameters, quality control, auxiliary equipment and will reuse them afterwards so that the needs of high-end customers will be satisfied. • Parkins Plastic Machinery displayed a fully automatic double servo control double line T-shirt bag making machine that can produce two printed T-shirt bags simultaneously. An automatic stop is triggered when an abnormal situation in the production process is detected, and an alert is sent to the operator to avoid any waste and protect the machine at the same time. Also, this machine uses an operational interface with an easy control. • Chumpower, a leading major manufacturer of PET blow moulding machines in Asia-Pacific, has introduced ultrahigh-speed linear stretch blow moulding machines: CPSB-LS6 / CPSB-LSS8. The machines can not only achieve 2250 bph in a single cavity, but also fit in the six-cavity (13500bph), eight-cavity (18000bph) models to accomplish long-term stable production. • Chuan Lih Fa (CLF) launched its electric injection moulding machine CLF-230AE equipped with high-end Siemens control system and servo driver offering multi-axis control, high-speed injection, high efficiency and energy saving to exhibit 16-cavity flip top caps moulding. • Chen Hsong showcased full-electric injection moulding machines and high-efficiency packaging machines. These are models created with the environment in mind. • Fong Kee International Machinery offered on the floor E-Blow fully electric blow moulding machine that can produce a full range from 20ml bottle to 30-litre canister. This model has been developed to keep up with the latest Industry 4.0 trends. Apart from the PLC and HMI control systems being used, SCADA system is available to link through internet to collect all data and monitor remotely. • In line with the rise in environmental consciousness, Ye I has developed plastic waste recycling machines that are not only designed with a combination of a shredder, extruder and pelletiser suitable for all kinds of plastic materials, but also with twin hydraulic cylinder type screen changer that allows changing screen without shutting down the machine. • Everplast showcased a wood plastic composite line that can produce products that use natural fiber mixed with PP/PE resin or PVC that are close to real wood grain colour and that can be supplied in the assembly of roofing tiles, summer houses and furniture. • Hemingstone Machinery featured a fourth generation super high-speed soft loop and die-cut handle bag making machine that offers improved design of double sealing mould environment for loop handle section. • Diing Kuen Plastic Machinery displayed a multilayer HDPE/LDPE/LLDPI/PP inflation machine, which was the tallest machine at the show. • Tenso, a specialised manufacturer of robots, has introduced its six-axis servo drive robot for the plastics industry. • CYKF launched its CK-32HT multi-function laboratory co-rotating twin screw pelletising compounding system at the show.